David DeAveiro, head coach of the McGill men's basketball team, has guided the Canadian national cadet team to a four-game sweep at a tournament in Troyes, France. Canada cruised to an 89-62 decision over Argentina, Saturday in their final preparation game before heading to the FIBA under-17 world championships in Dubai, Aug. 8-16. David DeAveiro, head coach of the McGill men’s basketball team. David DeAveiro, head coach of the McGill men’s basketball team, has guided the Canadian national cadet team to a four-game sweep at a tournament in Troyes, France. Canada cruised to an 89-62 decision over Argentina, on Aug 2, in their final preparation game before heading to the FIBA under-17 world championships in Dubai, Aug. 8-16. Montrealer Jerome Desrosiers, a 6-foot-7 forward, was named tournament MVP. The national team, which departed Canada on July 28, opened the tourney with an 81-78 win over France (July 30), followed by a 79-62 win over Puerto Rico (July 31) and an 88-85 conquest over Australia. At the upcoming FIBA U-17 championships, Canada is slated to take on France (Aug. 8), Japan (Aug. 9) and Dubai (Aug. 11) in the preliminary round. DeAveiro is heading into his fifth year at McGill, where the 50-year-old native of Toronto has posted a 78-58 record overall (.574), including a 70-42 mark (.625) against CIS opponents and a stellar 45-19 record (.703) in regular season play. He has led McGill to back-to-back appearances at the CIS Final Eight tourney. Including his 10 years as bench boss of the Ottawa Gee-Gees, he owns a career CIS coaching record of 288-185 in 473 games overall (.609). DeAveiro, who has been named four times as conference coach of the year (2006, 2007, 2010, 2014), was appointed head coach at McGill in 2010 after a stellar playing and coaching career with Ottawa, guiding the Gee-Gees to three appearances at the CIS Final Eight. He has an extensive history as a coach with numerous Canadian national teams, including the men’s senior, development and junior levels. 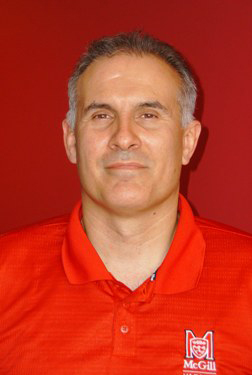 He guided the Canadian U-16 team to bronze at the 2013 FIBA Qualifier in Uruguay. He coached the Canadian U-18 squad at the FIBA world 3-on-3 championships in Jakarta (Sept. 2013), led a group at the 2012 Nike NBA Americas team camp and also guided the Canadian national cadet team to a fifth-place finish at the 2012 FIBA under-17 world championship in Lithuania. Among DeAveiro’s stints as an assistant coach was with Jay Triano’s staff on the national hoops squad at the 2011 Pan Am Games in Mexico, a 2003 pre-Olympic tourney in China, the 2007 FISU Summer Games in Bangkok where Canada won bronze, the 2008 FIBA Americas under-18 championship in Argentina and the 2009 FIBA world junior championship in New Zealand. A graduate of both the University of Ottawa (B.Soc., ’89) and Brock University (B.Ed., ’92), DeAveiro spent 19 years with the Gee-Gees, including five seasons as a player (1984 to 1989), five as an assistant coach (1990 to 1995) and nine as head coach (2001 to 2010).